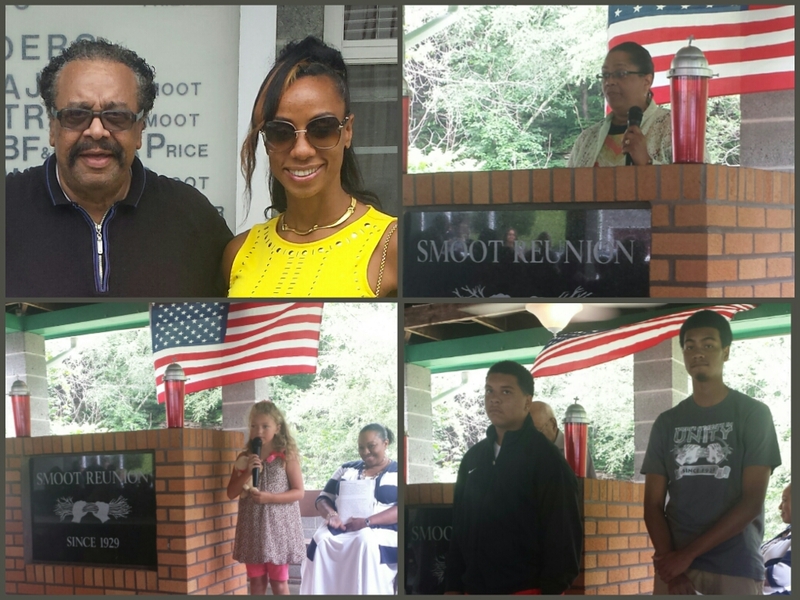 Last weekend, I made my way back to Madison, West Virgina for the 85th Smoot Family Reunion. Smoot roots run deep. Our family’s tradition is to have a fish fry and dance on Saturday night. 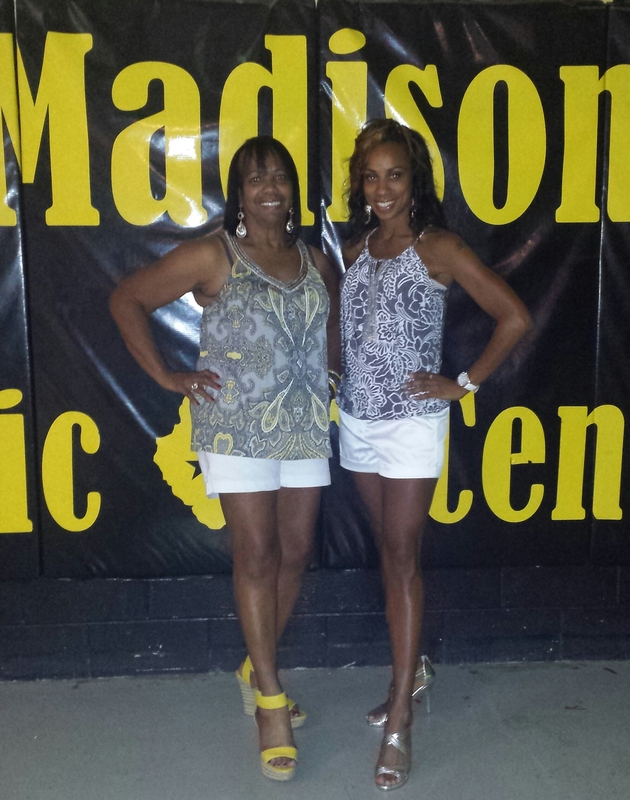 Normally, it is held at the pavilion, but this year it was moved to the Madison Civic Center. At age 103, Cousin Vada is the oldest family member. She worked for 50 years and only missed nine days. There were nine scholarships awarded with several college freshmen planning to major in Physics. It's not a reunion unless at least one photo is taken on the steps of my Grandparent's house. After a quick change into comfy running shoes, we headed back to the Bluegrass. 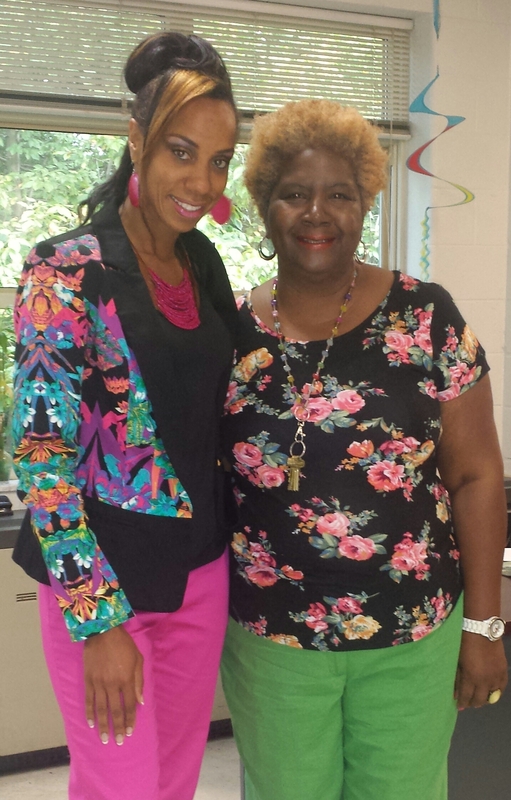 On Monday, I saw one of my favorite co-workers, Ms. Logan. I told her we had to take a pic with our coordinating florals. Her personality is equally as bright. She is a lady you interact with and walk away feeling uplifted. This past week has been very hectic with meeting and exceeding goals at work. The same passion I put into staying fit is transferred to helping my Smoodents reach their goals. On the St. Louis RNR training front, things are up in the air. I took two weeks off to nurse my knee. I eased back into training and did a 14 mile long run at a 8:31 pace yesterday. 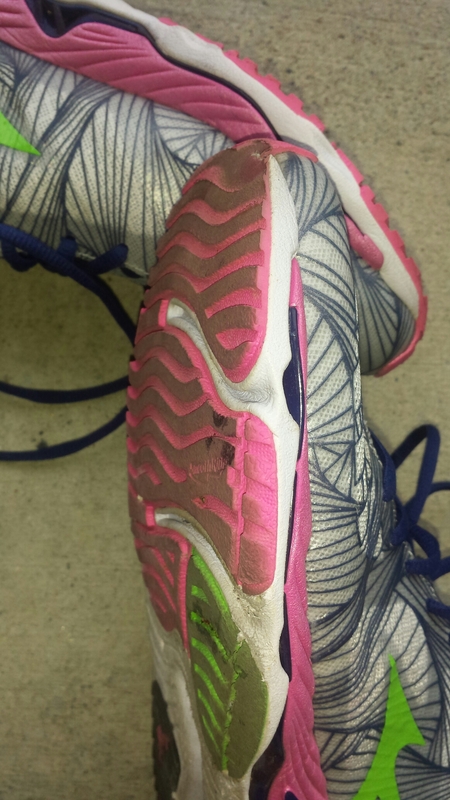 I have concerns over the Wave Mizuno Paradoxes. I’ve walked 6 miles and ran only 27 miles. The tread in the toe area looks worse than the four tires I just replaced on my car! My knee is still not 100%. The pain is coming from my patellar tendon. I purchased a Shock Doctor patella support strap to see if that helps. This entry was posted in family, fitness, half marathon, Louisville, marathon, running, Travel, West Virginia and tagged Ironman, Jumpers Knee, Patella Knee Strap, Smoot Family Reunion, volunteers. Bookmark the permalink. I found your blog as a result of a Google search that I did on “Smoot roots”. I too am a SMOOT descendant and I wonder if our families are related. My great-great-great-grandfather, Cyrus Smoot, was born in Virginia but he is found in the 1870 Census in Sumter County, Alabama, along with his wife, Fannie, and 3 of his sons: Prince, Cyrus Jr., and Leonidas. 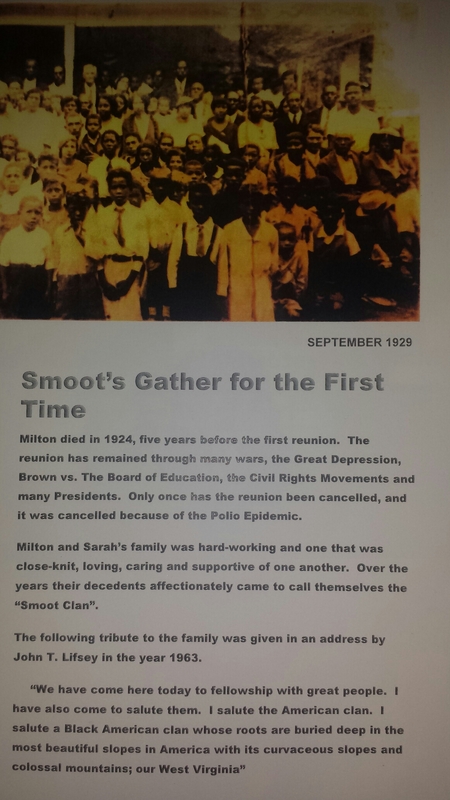 My paternal grandmother is the granddaughter of Prince Smoot, and her descendants just celebrated our 66th Annual Family Reunion on the land passed down from her father, Elijah Smoot. Last year we changed our reunion weekend from our traditional 2nd weekend in August to the last weekend in July to accommodate the many family units preparing for the start of school. We average about 200 each year who gather in Sumter County for the reunion. Who is the genealogist or historian in your family? I would love to compare notes to see if our families are related. I can be reached via my WordPress account if there is an interested party in your family. Thank you for sharing and may you be continually blessed! Thank you for reaching out. 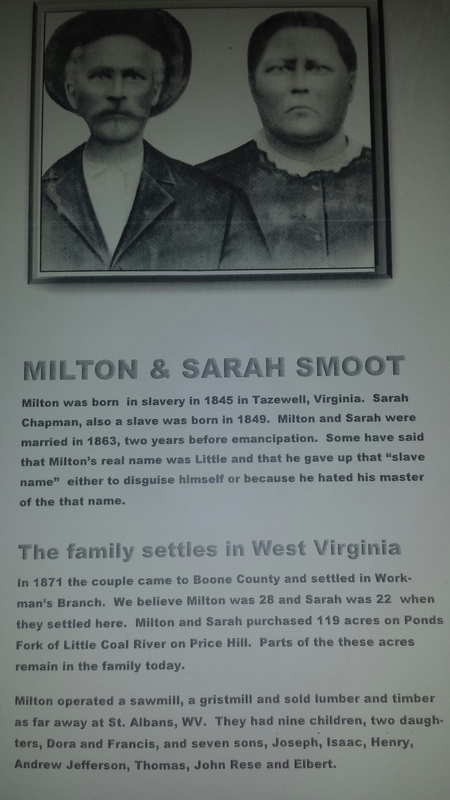 I am the descendant of Milton and Sarah Smoot. Milton was born into slavery in 1845 in Tazewell, Virginia. They moved to Boone County, West Virginia in 1871. My grandparents names are Boyd and Lucy Smoot. My great grandparents are Joseph and Nora Smoot. Our reunion is held the second Sunday in August in Madison, WV. The 88th just passed. I am not sure who our family historian is, but I will contact you as soon as I find out. Looks like a fun time! So cool that you know your family like that. We’ve never had a reunion. Smoot is fun to say. Smooooooot! Smooooooooooot! Thanks Scott! I needed that laugh! I really hope the strap helps. I have a knee strap that I’ve used in the past and I liked the results. What an amazing family reunion. I wish that my family had that sort of deep-rooted tradition! I’m getting it checked out on Thursday. Something I should have done weeks ago. I’ll keep you posted. Congrats on those negative splits in your last race! As usual, awesome post, filled with uplifting messages and fascinating family history. Thanks for sharing. A rich history and a beautiful family. Thanks Steve! Are you volunteering for Ironman?